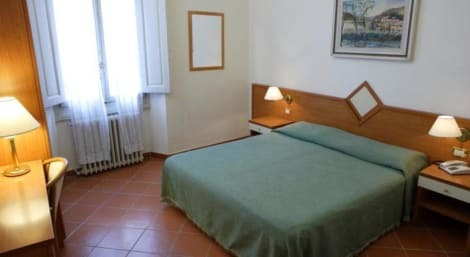 Located in Florence (San Lorenzo), Sogni d'oro Guest House is within a 15-minute walk of Fortezza da Basso and Statue of David. This townhouse accommodation is 0.7 mi (1.1 km) from Accademia Gallery and 0.7 mi (1.1 km) from Academy of Fine Arts. Just 200 metres from Santa Maria Novella Station, Hotel Jolì is set in a early 19th-century building in Florence’s centre. A buffet breakfast with hot and cold food is served daily in the breakfast hall. Each room at Jolì Hotel is decorated with light colours and either wooden or wrought-iron furniture. They are air conditioned and feature satellite TV. Some also feature a balcony. Staff is available 24 hours a day. Guests can read a newspaper in the lobby or relax on the furnished terrace right next to the breakfast room. The hotel is a 10-minute walk from the Florence Cathedral and 200 metres from the Fortezza Da Basso exhibition centre. With a stay at Hotel Spagna in Florence (Duomo), you'll be a 3-minute walk from Santa Maria Novella Basilica and Museum and 6 minutes by foot from Cathedral of Saint Mary of the Flower. This hotel is 0.3 mi (0.6 km) from Piazza del Duomo and 0.5 mi (0.8 km) from Piazza della Signoria. Tourist House Battistero The Tourist House Battistero is situated in Firenze. Guests can dine at the hotel restaurant. Room Features Tourist House Battistero. A hairdryer is provided in every room. Other Info. An airport shuttle service is available from the hotel. Pets are made most welcome at the hotel. A concierge service is available to guests. With a stay at Hotel Romagna in Florence (Duomo), you'll be within a 5-minute walk of Cathedral of Saint Mary of the Flower and Santa Maria Novella Basilica and Museum. This hotel is 0.3 mi (0.5 km) from Piazza del Duomo and 0.4 mi (0.7 km) from Piazza della Signoria. This charming 19th-century 2-star hotel is found in the heart of Florence’s historic centre on the trendy Via dei Calzaiuoli, one of the city’s best shopping streets, and within easy reach of museums, restaurants and bars. On site, the hotel has all practical touches covered, making it a great base for exploring the city. Enjoy the optional buffet breakfast each morning, stay connected with free wi-fi, or relax in comfortable rooms with satellite TVs and air conditioning.